The other side of celebrating Japan’s chivalry toward captured, wounded, or defeated foe was celebrating Japan’s moral as well as martial superiority. 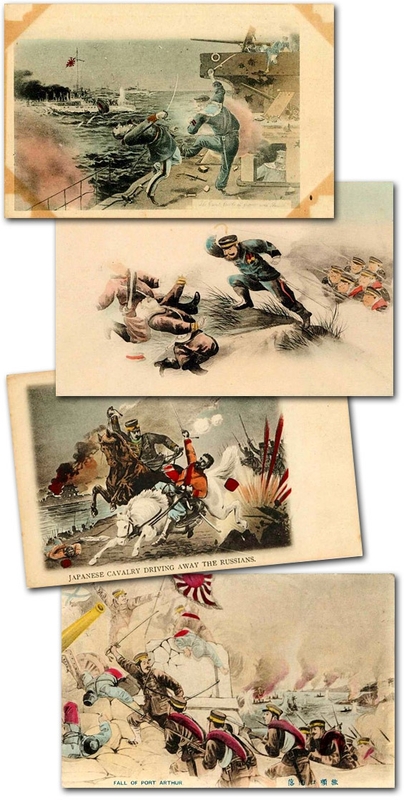 Chivalry did not preclude condescension, and many graphics put the Russians down. 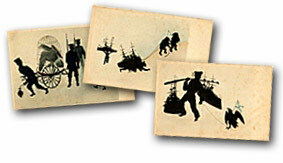 One of the more sophisticated postcard sequences, for example, done in silhouette without captions, renders the Russians as bears routed by a burning red sun. Some postcards tell the story of the war without any captions whatsoever. In this sophisticated “silhouette” set, both sides are represented by fixed symbols as well as human figures—the Russian as bears or an eagle, for example, and Japan as a blazing red sun. These bilingual graphics mock Russian retreat and surrender. The addition of English captions reveals an acute sense of both public relations and commercial opportunities on the part of the Japanese, since this made the cards accessible to a wider international audience. Sometimes mockery was cartoonish (and, in such cases, the humor was usually sophomoric). Thus, a postcard captioned “Naval review of Russian admiral” depicts a Russian donning a diving suit to view his sunken fleet, while fish stand at attention to greet him. The same series also offers fish and floating Russian corpses under the title “Submarine world." Trembling cartoon Russians are literally forced to eat lead, or bite the bullet. Retreating cavalry sit backward in their saddles to give the appearance that they are really charging. 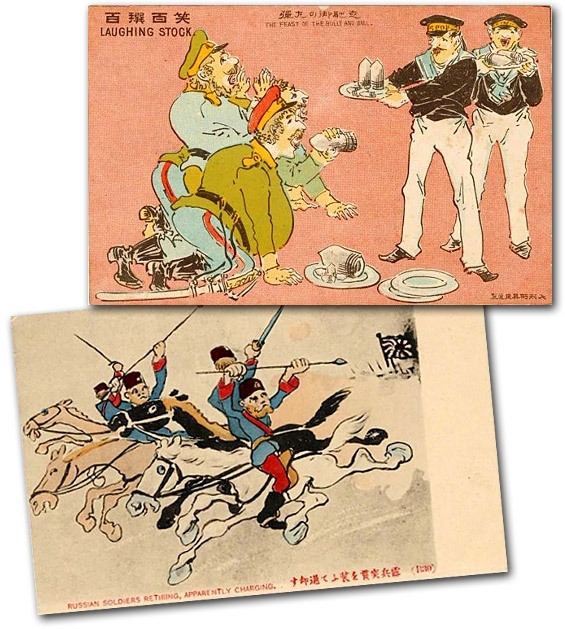 In these examples of forced humor, abject Russians “bite the bullet” (above), while retreating Russian cavalry pretend that they are really charging. Doomed soldiers at Port Arthur drop their colors and dance around in consternation at the sight of the Japanese army and navy. A weeping officer hoists a white flag in one hand and an electric light bulb in the other to make sure his abject surrender will be seen. 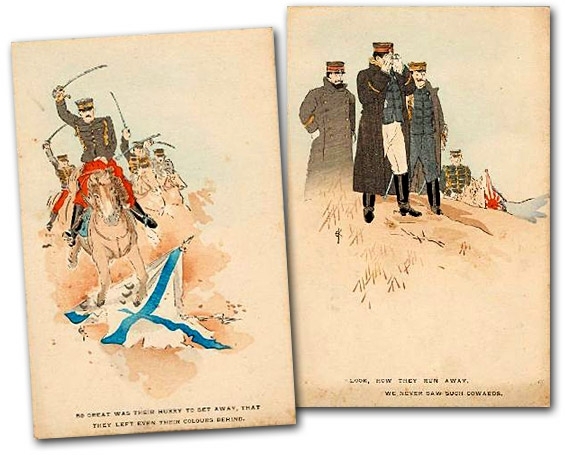 These caption-less graphics belittle the Russians who were forced to surrender Port Arthur early in 1905. 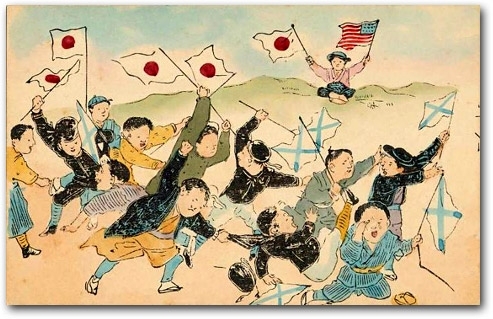 In this illuminating postwar postcard of Japanese children playing war games at	home, a boy in the background holds the Stars and Stripes as well as Japan’s own rising sun flag—an apparent reference to U.S. support of Japan’s victory. 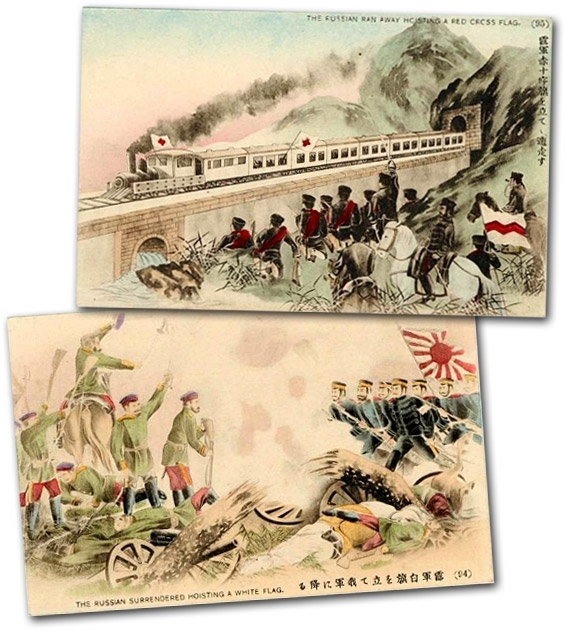 Other runs of postcards essentially replicate in miniaturized form the militaristic style and outlook hitherto associated with woodblock war prints. 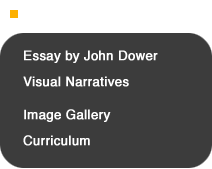 Indeed, one can literally see artists of the old school tumbling into this compact new mode of communication. 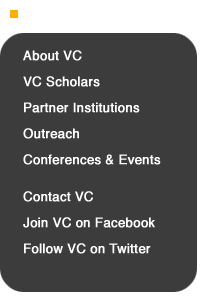 In illustrations of this sort, the play of heroism versus ineptitude is usually etched with particular sharpness. Japanese sailors kick Russians into the brine; sword-wielding officers lead their disciplined men in chopping down the foe; a Japanese cavalryman topples his Russian antagonist in one-on-one combat; Russian corpses lie scattered as Japanese troops storm Port Arthur under the Rising Sun flag. 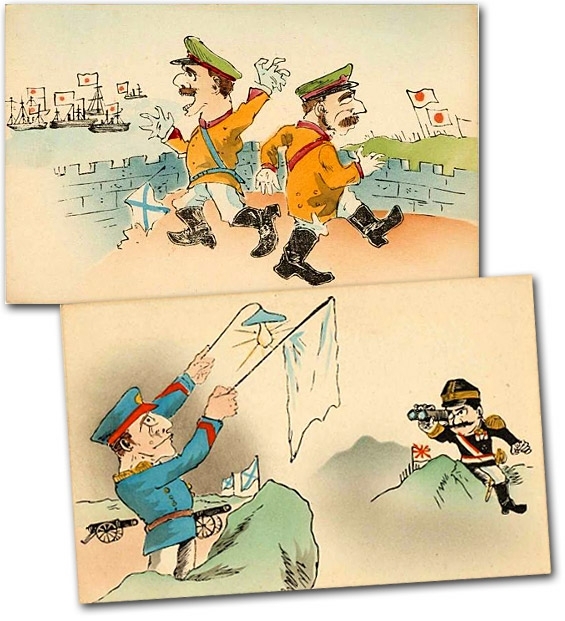 Although postcards replaced woodblock prints as the most popular art form for visualizing the Russo-Japanese War, some postcards retained the old-fashioned “look” of the woodblocks. In the full corpus of picture postcards of the war, however, such formulaic renderings—like the woodblock prints themselves—seem now, as they already did at the time, out of date and out of tune. 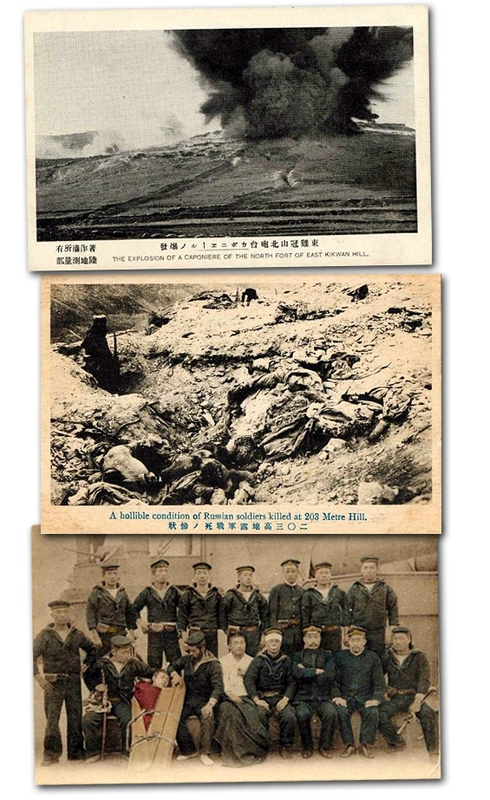 Photo postcards, for example, convey the nature of the war in ways these more traditional renderings could not match. Modern weapons, including artillery captured from the enemy and displayed as “spoils” back home, are more impressive in collotype prints or black-and-white halftones. Although photography was introduced in the 1840s and 1850s, the technology of mass reproduction was not perfected until the turn of the century. 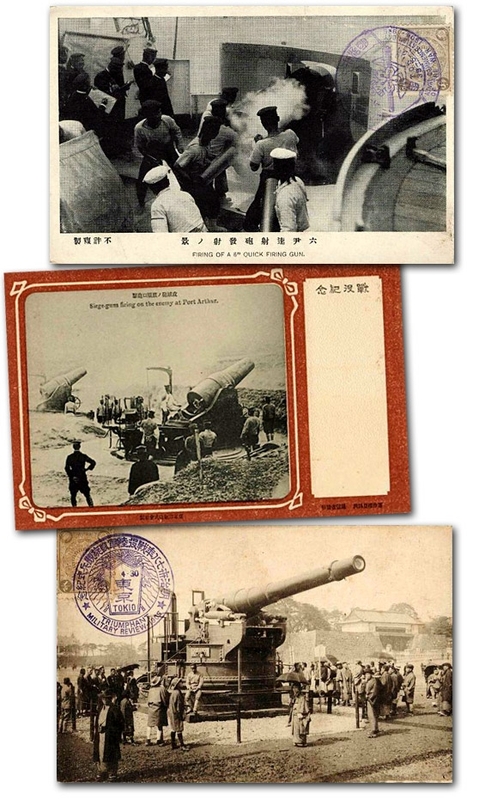 The Russo-Japanese War marked the moment when war photography became truly accessible to the general public worldwide—and postcards were one of the major vehicles for their dissemination. As seen here, photos captured such subjects as the machinery of modern warfare in ways conspicuously different from the impressions usually conveyed in artists’ illustrations. Huge explosions erupt like volcanoes on the Manchurian landscape. Real enemy corpses litter the battlefield. In one unusual tinted photograph, sailors pose after battle with a few of their wounded, including a comrade in a full-body splint that looks almost like a makeshift coffin. Photographs also succeeded in conveying in new ways the explosiveness, carnage, and human faces of modern war. Some photos were artificially tinted to enhance their impact, as seen in the unusual group portrait of Japanese sailors (above), which includes a wounded comrade in full body splint. 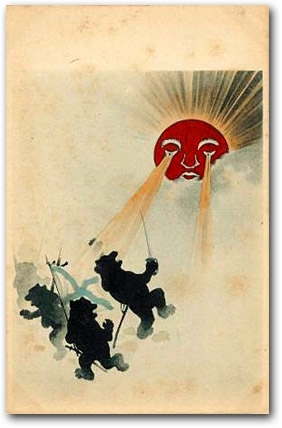 More often however, and more originally, Japanese postcard manufacturers romanticized the victorious war on land and sea by combining photographs with elegant designs, or by relying entirely on modish and distinctly Westernized (and yet still distinctively Japanese) illustrations. In the former case, land battles are framed in autumn foliage, melting snow, even smoldering ruins that somehow manage to soften the real impact of the war on local populations and communities in Manchuria. Warships may be set against a naval motif such as anchors, but just as often they are graced with a border or background of flowers. 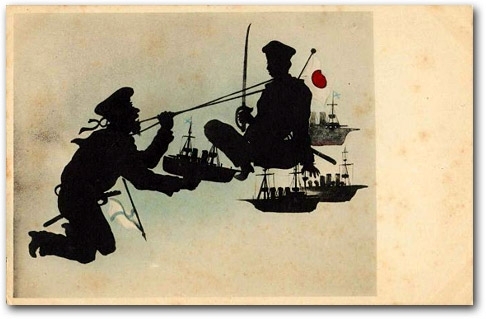 In their Russo-Japanese War graphics, Japanese postcard designers often introduced a strikingly “modern” approach by combining war photographs with accomplished (and often aesthetically elegant) artists’ illustrations. This beautification of war was sometimes further enhanced by embossing parts of the card. Many postcards that eschewed photographs entirely are almost breathtaking in their stylistic verve. A flat, abstract, fire-red explosion carries no caption at all. A mysterious wisp of cloud (or smoke) and tiny Japanese flag float suspended in a red sky above an outline of tile roofs suggestive of the continent. In one remarkable design, a sailor strides through a torn Russian flag toward Japan’s own triumphant military ensign. Another image employs lines fine as fingerprints (and pink, blue, beige, and black colors) to turn underwater mines into a delicate design motif. A bold silhouette rendering of a sleek cruiser cutting through high seas, with swallows flying across the foreground in the opposite direction, might well have made for a celebratory poster—except that the vessel flies the Russian flag. 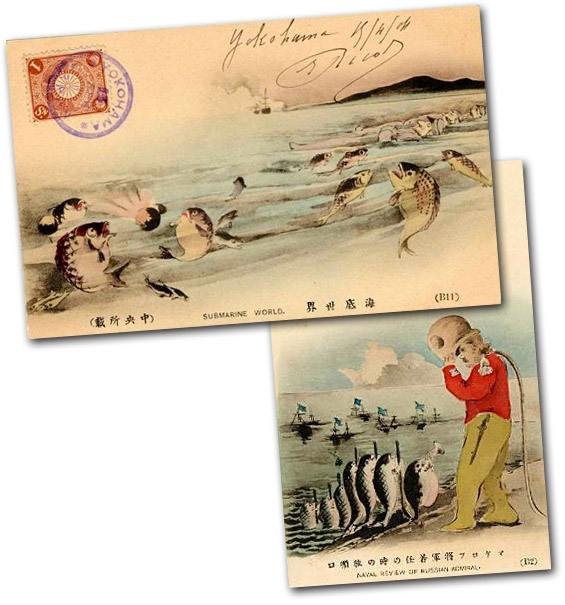 One remarkable design even celebrates picture postcards themselves, scattering several commemorations of the naval war on an elegant underwater scene of small fish and graceful strands of seaweed. Avant-garde Japanese artists used the new medium of postcards to introduce popular audiences to a world of dramatic images that often seemed to make the harsh realities of the war secondary to sheer aesthetic virtuosity. Explosions, enemy warships, underwater mines, nationalistic symbols such as the rising sun and cherry blossom; all were rendered with an ebullience that sometimes bordered on adoration. Illustrators let their imaginations run free in comparable ways for the imperial army. Horses, to take one simple but popular example, might carry generals, cavalry, local “mounted bandits,” or supplies; or rest unsaddled while their riders gathered around a campfire. In one composition artfully linking the battlefront and home front, an attractive female student hands a bouquet of flowers to a handsome mounted officer who is framed, as it were, in a perfect rising-sun circle. Ordinary aspects of modern land warfare such as infantry movements, bivouacs, and cavalry were turned into a remarkable range of original and still distinctively Japanese designs. Images from the Leonard A. Lauder Collection of Japanese Postcards at the Museum of Fine Arts, Boston. Unless otherwise indicated, all are by unidentified artists and date from the 1904-1905 war years.